Whenever we begin talking about the greatest stories of all time – the ones that have really shaped societies and cultures – we often find ourselves using the word myth. 1. a traditional or legendary story, usually concerning some being or hero or event, with or without a determinable basis of fact or a natural explanation. 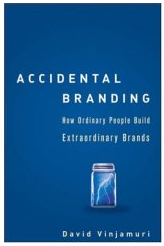 A recent interview with David Vinjamuri, the author of of a new book titled Accidental Branding, stood out to me as we think of storytelling and well, myth making in the brand context. “What lesson would you engrave in stone for entrepreneurs? Well said, Mr Vinjamuri. Perhaps myth should earn its place right next to story in our brand communication lexicon. Epic.